I want to thank Balzer and Bray (Harper Teen) for sending me a copy of this book to read and give an honest review. Receiving this book for free has in no way influenced my opinion or review. So, I'll be honest from the get go and let you know that I did not read the blurb for this book prior to reading it. I loved the cover and heard so many people praising it, I just had to read it. So, when the chance presented itself, I jumped right in. To not mention the cover would be a sin. So there I go. It's just gorgeous. I love the color scheme and imagery. It's really quite fantastic. So just by looking at this cover I wanted to read the book! I'm a huge fan of fairy tale retellings. Or any retellings, to be honest. I love to see how authors take what I know and twist and turn it into something that it totally and completely unique. Hodge does this in such a great way. While I had heard it was a Beauty and the Beast retelling, I can honestly say while there are definitely underlying themes of this story, it is totally different and new. And I really didn't fell like I was reading a retelling but rather I was reading a unique story about a young girl who is sent to her death only to meet and fall in love with the man she should be set to kill. It's dark and twisty and romantic and amazing. Nyx is such a strong character. I love how she is determined to find a way to save everyone. She begins her trek as a selfless person, hell bent on making sure her town becomes free. I really loved this character. She is strong and stoic. She does have very strong opinions and sometimes those get in her. While she wants to be good, she has this underlying darkness that is itching to break free. And she's snarky and sarcastic, which works well with the other main characters: Ignifex and Shade. Ignifex and Shade, two sides of the same coin it seems. Ignifex is the monster, hell bent on containing Nyx's village of Arcadia. Shade, on the other hand, has a hand in wanting Nyx to free the city. Ignifex is all that is dark and brooding in a character. I really loved him from the very start. He was snarky and fun, a great compliment to Nyx. I seem to be drawn to the "bad guy" in books more often than the gentle souls that are portrayed as the best boyfriend material. This is Shade. He is loving and gentle side of the coin. He shows Nyx things she would not otherwise be able to see. I will say that Nyx's sister, Astraia, really made me mad. I just didn't like her at all. In the beginning of the book she's so childish compared to her twin. I just can't understand how she could be so different. But later on in the book we see another side of her, one I was not expecting at all. It was liked she flipped a switch and became a different character. And I hated what she asked of Nyx. The plot of this book is completely amazing. For the first three or four chapters, Hodge hits us with a lot of world building. I almost felt it was going to be a book full of info-dump. But I quickly learned that all this was necessary so that I could understand why Nyx needed to marry the Gentle Lord (demon lord, really, not sure of the name Gentle since he's anything but!). It's an intricate story of twists and turns, with slow reveals of information that peel back layers as reveal truths. Hodge also infuses a lot of Greek Mythology into this book: The River Styx, Pandora's Box and a bit of high fantasy. And Hodge's writing, just...WOW. I am not sure I can adequately describe how rich and fulfilling it was to read her words. She paints pictures that are very vivid and real. She makes things complex and intriguing. There are some areas that I had to re-read in order to really grasp the ideas and understand what was going on, but it did't deter me from wanting to continue and figure out just what was going on. All in all this book was absolutely fabulous. A fantastic debut novel. It's totally original and there's no way that my review would ever be able to truly capture its power. I urge you to pick it up, and read, and keep reading, and then finish reading and sigh as I did when you put it down at the finale! I'm really looking forward to Gilded Ashes and anything else Hodge decides to write. She has pushed her way into my top author list for sure! I love mythology, Hello Kitty, and T. S. Eliot. 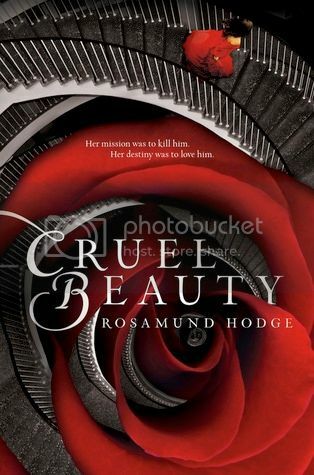 My debut novel, CRUEL BEAUTY (a YA fairytale fantasy, where Greek mythology meets Beauty and the Beast), is due out from Balzer+Bray/HarperCollins in Winter 2014. Nice review Brooke..... i too actually only skimmed the summary, didn't read it that much because the cover was enticing enough......... excited to see what's next in this universe..
Julie, pretty sure you'd enjoy this one for sure! I was on the fence with this and your review made me go for it. Thanks so much your review so are always spot on!